I have really grown to love the flavors of Cuban food. All except for cilantro...still can't abide the stuff. Smells like dirty socks to me, and apparently that's some sort of genetic "I can't help it so don't tell me how good the stuff is" thing. 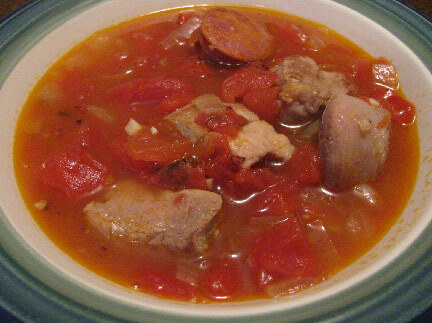 I recently made a Cuban Pork and Beans Stew that I found in Hannaford's Fresh magazine. But I made several changes. I neglected to soak the dried beans overnight, so I ended up using canned. That was fine, because I really prefer small red beans to black beans anyway, which is what the recipe calls for. Also, I seared the meat before stacking the slow cooker, because nothing tastes better than seared meat...boiled just doesn't do it!